I realize I’m likely to be condemned for high summer treason for what I’m about to suggest, but I feel it must be expressed: let’s skip the grill at our next barbecue. When the tables are loaded with sides as vibrant and beautifully fresh as today’s Pesto Potato Salad, I’m far too distracted to care about what’s being served between the buns. Before the High Court of All Barbecue strips me of my tongs and denies me access to Peach Shortcake as punishment, please hear my plea. Yes, burgers are good. Yes, a hot dog during June and July is a necessity. But would I choose said hotdog or burger over a crisp serving of addictive Asian Ramen Salad, fresh and fruity Red White and Blue Quinoa Fruit Salad, or Cheesy Jalapeno Cornbread? The answer is no, no I would not. At nearly every backyard cookout I attend, I find myself taking a few obligatory bites of the burger or dog, mostly as a way to make more room on my plate for yet another serving of Easy Baked Beans. I could make a meal of the sides at any barbecue and leave a happy girl. Now, I am not advocating that you spend this Fourth of July burgerless, hot dogless, or without a grill—even my side dish-loving soul admits that this would feel unnatural and offensive. I am, however, insisting, that you take a moment to consider your spread and give attention to the salads, the bakes, and the dips that honor and celebrate the gorgeous abundance of summer produce. 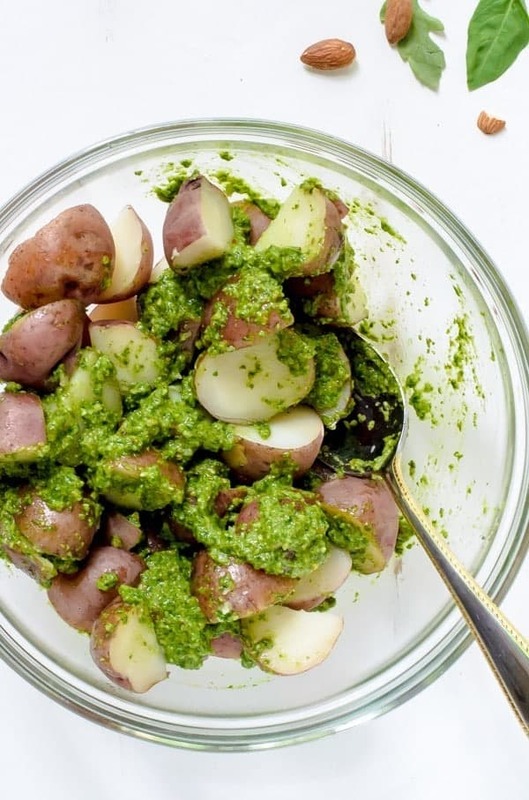 This Pesto Potato Salad is the perfect place to begin. Although I consider sides my soul food at summer events, I’ve never been a fan of the classic mayo-based potato salad for two reasons. One, I find nearly all of them to be excessively goopy and sorely lacking in flavor of any kind, which is a crime when you consider what wonderful little vehicles for bright, herbaceous, and zippy tastes that summer new potatoes can be. Two, I have an irreversible, life-long aversion to mayonnaise (just ask my mother). Let’s ditch the soggy mayo blob for a bright, zesty pesto potato salad that shouts summer. I blended peppery arugula, basil, and almonds in my trusty food processor, then tossed the resulting pesto sauce over potatoes that I lightly boiled on the stove. To add extra green and incorporate even more of summer’s bounty, I folded in quickly blanched green beans and peas. 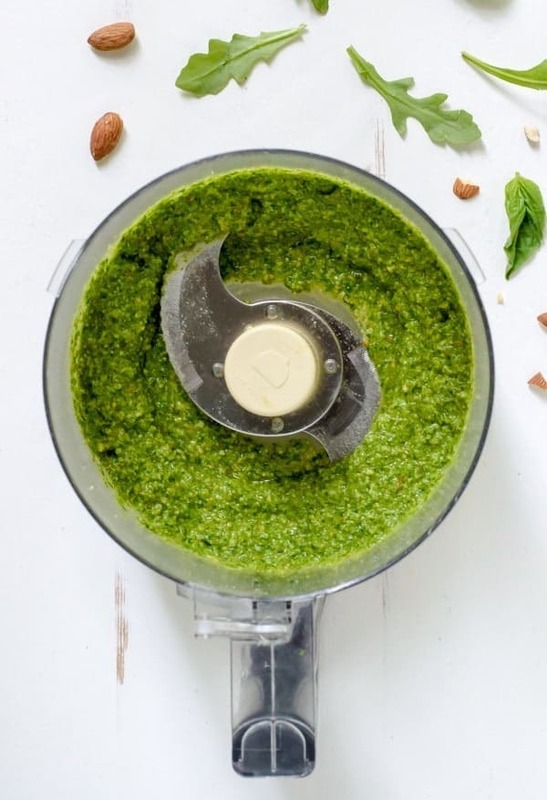 Feel free to add other herbs or nuts you love to the pesto, grill the potatoes instead of boiling them, and even to use frozen peas to speed up the prep. 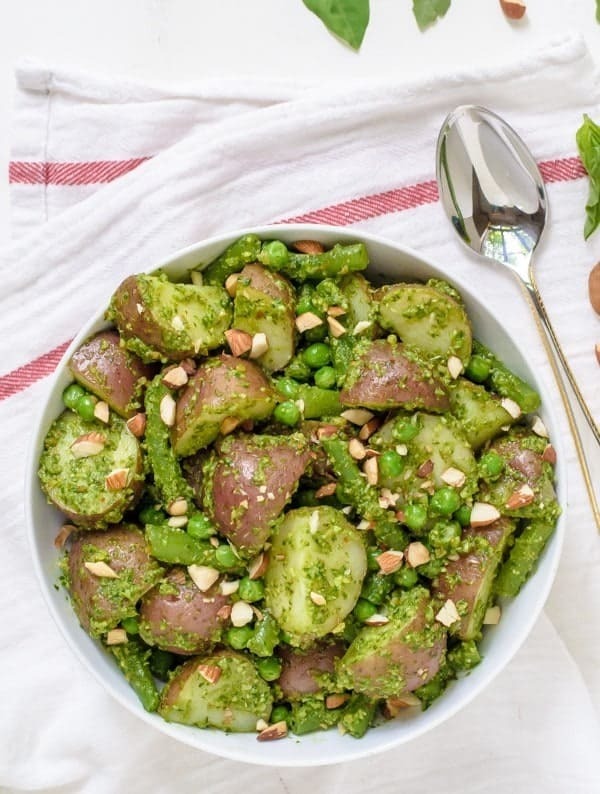 This Pesto Potato Salad recipe is deliciously forgiving, though I must say—I’m quite smitten with how it came out as written. Every spoonful of Pesto Potato Salad makes me want to lie in the sun or stand with my barefeet in freshly cut grass. It’s a bowl full of magnificent summer, ready to be shared with the people you love most. Dear High Court of All Barbecue: might I swap you a generous serving of Pesto Potato Salad in exchange for lightening my sentence? 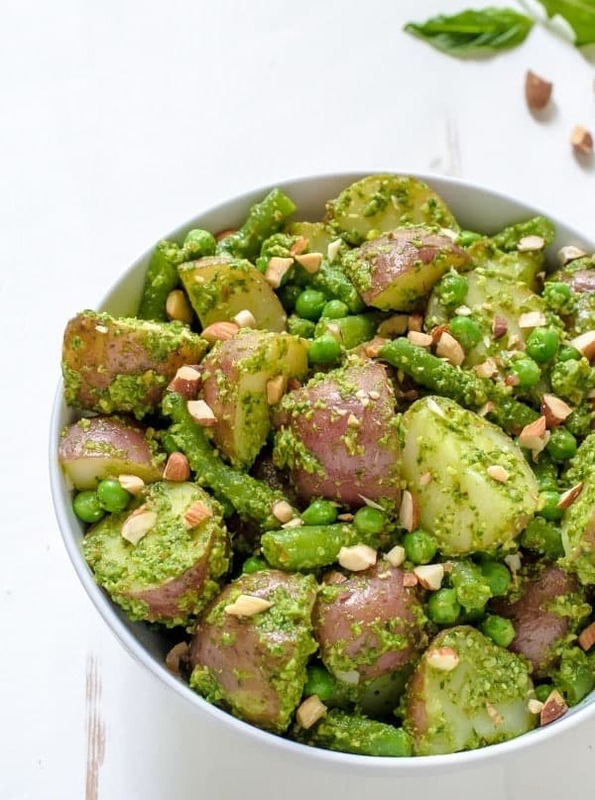 A bright and healthy pesto potato salad with green beans and peas. Every bite bursts with fresh summer flavor! Place the potatoes in a large pot, cover them with cold water, then sprinkle with 1/2 teaspoon kosher salt. Bring to the pot to a boil, reduce heat to a simmer, then cook until fork tender, about 10-15 minutes. With a slotted spoon, gently remove the potatoes from the water and place them in a large bowl. Set aside. Return the water to a gentle boil, then add the green beans to the pot. Let cook just until crisp-tender, about 3 minutes. Drain into a colander, then quickly rinse the beans with cold water to stop their cooking. 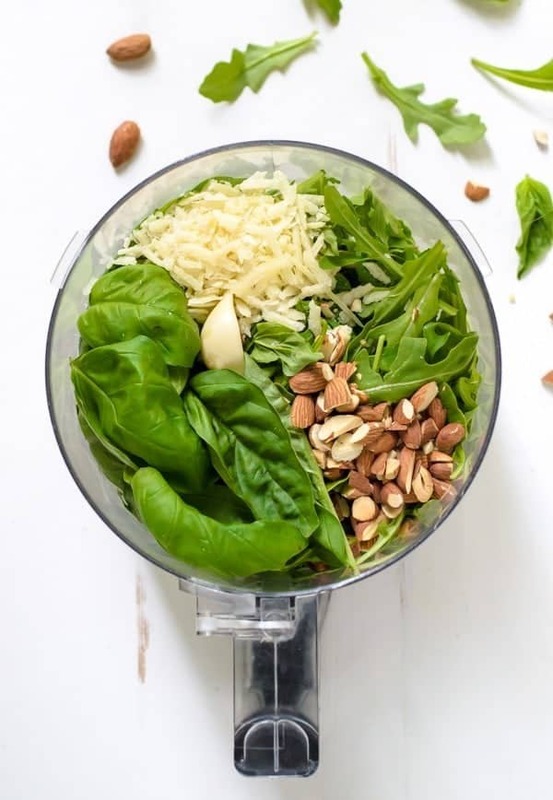 In the bowl of a food processor fitted with a steel blade, add the basil, arugula, 1/3 cup almonds, Parmesan, garlic clove, 1 tablespoon lemon juice, and 1/4 teaspoon salt. Pulse the ingredients until evenly ground. With the machine running, slowly pour the olive oil into the feed tube and blend until smooth. While the potatoes are still warm, pour the pesto over the top, then toss gently to combine, being careful to break up the potatoes as little as possible. Add the green beans to the bowl with the potatoes, then add the peas and remaining 1/4 teaspoon kosher salt. Stir all of the gently to combine. Squeeze a little fresh lemon juice over the top, then sprinkle with 2 tablespoons chopped toasted almonds. Serve warm, at room temperature, or chilled. Leftover pesto potato salad will keep well in the refrigerator for 1 full day and can be made a day ahead as well. By days 2 and 3, it will still be edible, but will lose some vibrancy and crispness. Looking for more Fourth of July or potluck/barbecue recipes? I have a whole section right here! I am SO with you on making a meal out of side dishes. ESPECIALLY when it involves ANYTHING pesto…AKA: my current obsession. So this potato salad is coming to a face near me! Pinned! I would live on pesto if that were possible. This potato salad has my name written all over it! This looks wonderful and I love that the mayo is subbed for a lot more flavorful ingredients and healthy fats. You have a great memory Ali!! Yes she is. We should join forces, lol. Thank you so much. I’d be honored to be a side dish queen! Yum!! I am all about the flavorful potato salads.. I can’t even understand the gloopy yellowy potato salads that still grace deli counters! That being said, since I’ve been prego, I am ALL about the burgers, but they have to be good.. and so often they’re not! The toppings are where it’s at, just like taking care of powerful flavors in a potato salad!, and they’re usually ignored, a couple bottles of ketchup and mustard left out as an afterthought. No way! it’s ALL about the sides!!! Not just at a bbq, but even at the holidays! 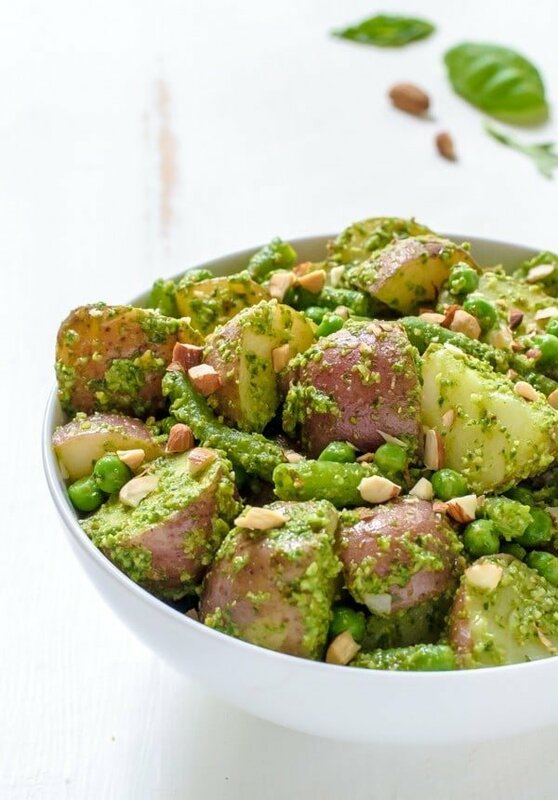 this is exactly the kind of potato salad i want..
Pesto potato salad is my absolute FAVORITE! I have a bit of a mayo aversion myself but since I can never deny myself potatoes, this is the most perfect pairing ever! So with you on side-dish only meals, too. I rarely touch the meat at bbqs because the sides are just that much better! I admit – I have to agree with you on this one! While I’m not against the grilling of meats, I am much more interested in the side dishes filling my plate. I love how this potato salad uses one of my favorites in summer produce – basil ! Looks delicious, Erin! Ugh I totally need this. Sounds amazing! Barbecues are the definition of my summers so this is so perfect! While I never skip the hot dog or the burger (or the brat), I’m allll about the sides, I could easily shovel an entire plateful of this into my stomach without hesitation! All sides, all the time! Although, I’ll probably cook some sides and desserts on the grill too – so I won’t give up my trusty tongs yet. But yes to totally skipping the main event. I feel like that at Thanksgiving too. This potato salad is gorgeous! Mayonnaise and me aren’t really friends, so I’m digging this mayo-free version! Sides are my favorite, too!! I feel like I can just keep picking at them without feeling the full heft of a burger on a bun or a hotdog. Besides, sides are were the creativity’s at, usually! Love this potato salad (esp. b/c it’s a no mayo version)! Simple salad but must be really delicious! OMG yes! I rarely bother with what comes off the grill. The sides are where it’s at! This time of year, the fresh basil is everywhere. This potato salad is an absolute must! Hey girl- I’m willing to try this!! Very creative! I’m making this for the 4th. How many servings as I think I will have to at least double. Hi Jessica! It will serve 6-8 as a side dish. I hope you love it!! Thank you for the speedy reply. I hope I don’t eat 1/2 of it before I leave the house! Love this salad! Being from New Orleans, I boiled the small potatoes in a little bit of Seafood Boil and New Orleans seasoning and added a homemade pesto with walnuts instead of almonds. It’s such a refreshing salad and don’t have to worry about leaving it out a while since it has no dairy. Highly recommend it! GiGi, thanks so much for trying the recipe and taking time to share this kind review. I truly appreciate it, and am so happy you loved it!